PILI, CSur—If the dog is man’s best friend, the carabao is the small farmer’s best buddy as it helps ease farm works and also helps transport farm produce through all kinds of terrain. Thus, the DA's Special Area for Agricultural Development (SAAD) program granted the requests of some of the beneficiaries of the program to have their own draft animal. 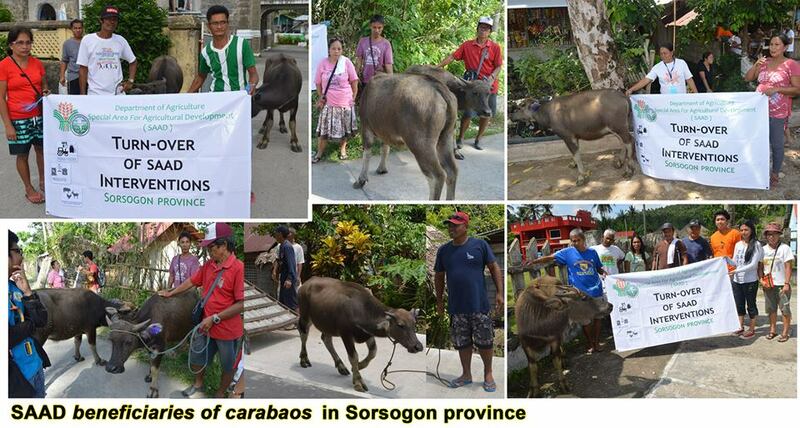 As of October 30, 2018, the SAAD program in Bicol has distributed a total of 50 carabaos (native caraheifers) to 40 individual beneficiaries in the municipalities of Balud, Mandaon, Esperanza and Pio V. Corpuz all in Masbate and to 10 farmer-beneficiaries in Sorsogon. The beneficiaries of the SAAD in Masbate were very grateful for the carabaos they received as they really need draft animals in cultivating their lands especially now that they could scarcely afford the petroleum necessary in operating a tractor. Most of the beneficiaries are living in remote areas which are not passable to public utility vehicles. Transporting goods from their farms to the market centers have long been a problem. With the carabao’s heavy built, it can travel in all kinds of terrain and can carry their produce including their children. Other interventions already distributed to the beneficiaries in the provinces of Masbate, Catanduanes and Sorsogon included native goats, native pigs, native chicken, and ducks; white corn seeds and upland rice seeds with complete fertilizer; packets of vegetable seeds such as okra, pechay, bush and pole sitao and ampalaya, organic fertilizers, drums, garden tools, plastic trays, wheelbarrows, UV treated plastic for greenhouse and HDPE pipes.